Since Nov. 8th, 2006 he is not in office anymore, forced to live by the shares he owns. Regrettable. Before he was called "war criminal" by the "Military Times" and others . There is no justice if Rumsfeld is not brought to court because his war crimes AND his involvement in 9/11. Every war has (at least) two sides: aggressor and defender. "America is under attack!" these words uttered by so many officials incl. Andy Card in Sarasota mean "the U.S.A. is at war". This view of the events was expressed so many times that any criminal investigation concerning the crime of 9/11 should be banished out of the agenda of any American official, politician or concerned citizen. 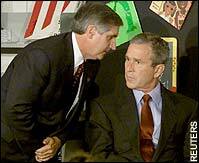 "This is not a criminal action," the secretary of defense told Bush over a secure line. "This is war." America is under attack. A war. The secreatry of Defense must think about that. Let us take it at face value - so a historian (but also any general in the field) does not only ask how well equipped and tricky the aggressor was. They will also ask after a strike with heavy losses in the field "Why were we so weak? Who was not on his post? What did the sentry notice? Where was the first line of defense? and so on. * let us concentrate on one man: Rumsfeld. The commander of the defenders. I already covered Bush and the first line of defense, that is the allegedly scrambled fighter jets from OTIS ANG on Cape Cod. Jared Isarel did fine research on the Andrews AFB in Washington. Rumsfeld was sitting on his hands. Not because he didn`t know. Not because there were no interceptor jets at hand. Not because the National Military Command Center was out of order this day. Not because he was doing something which could be judged as more important. 2,3 trillion Dollars. Just vanished. Whatever this amount means: related to which time, which budget ? And guess which wedge was hit in the Pentagon ? "One Army office in the Pentagon lost 34 of its 65 employees in the attack. Most of those killed in the office, called Resource Services Washington, were civilian accountants, bookkeepers and budget analysts. They were at their desks when American Airlines Flight 77 struck." It seems to be the only department which re-entered the building after renovation. 8:00 Breakfast. ( maybe an error in recalling the time, most sources take 9:00 for the scheduled time.) 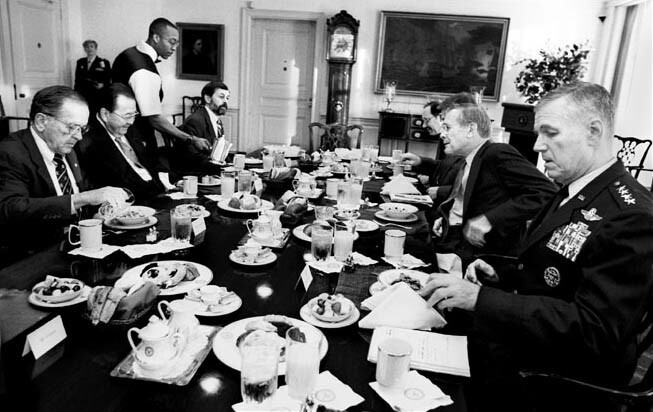 Rumsfeld: "I had said at an 8:00 o'clock breakfast that sometime in the next two, four, six, eight, ten, twelve months there would be an event that would occur in the world that would be sufficiently shocking that it would remind people again how important it is to have a strong healthy defense departmen ..."
8:13 All signs of a hijacking noticed by FAA airtraffic controllers (American Flight 11, no radio, no transponder, sharp turn of flightpath). This was followed by one hijacking after the other - and this alarming situation was radioed to the pilots of civil planes too. I.e. the pilots of UAL93 were well aware about hijackings AND the impact in WTC 1). "Well, the terrible moment was actually earlier at about 8:40, 8:45 when we realized a plane and then a second plane had hit the World Trade Center. And immediately the crisis management process started up. A couple of us had gone into the secretary's office, Secretary Rumsfeld's office, to alert him to that, tell him that the crisis management process was starting up. He wanted to make a few phone calls. So a few of us headed across the hallway to an area called the National Military Command Center. He stayed in his office. We were in these rooms maybe 200 feet away where we felt the concussion." Police, medical personal, firebrigades were on duty at this time. Not at least several camera teams and TV reporters. They all knew what to do and that the situation was exceptional. Same with me and you: everywhere in the world millions switched on their TV. 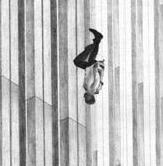 The first victims began to jump People in the South Tower could watch this live from their windoes before they were hit too. .Even a survivor recalls: "But when the second building got hit you instantly calculated the two of them: terrorism. "..
9:00 Breakfast. "At 9 a.m. EDT Tuesday, as a hijacked Boeing 767 slammed into the World Trade Center, I was in the Pentagon in the private dining room of the Secretary of Defense. Don Rumsfeld, the Secretary, and Paul Wolfowitz, the Deputy Secretary, and I were discussing how to win votes for the Bush defense plan that is now pending in the House and Senate." "There didn't seem to be much to do about it immediately"
"Wolfowitz: We were having a meeting in my office. Someone said a plane had hit the World Trade Center. Then we turned on the television and we started seeing the shots of the second plane hitting, and this is the way I remember it. It's a little fuzzy. Wolfowitz: There didn't seem to be much to do about it immediately and we went on with whatever the meeting was. Then the whole building shook. I have to confess my first reaction was an earthquake. I didn't put the two things together in my mind. Rumsfeld did instantly." "'We were watching the World Trade Center on the television,' said a Navy officer. 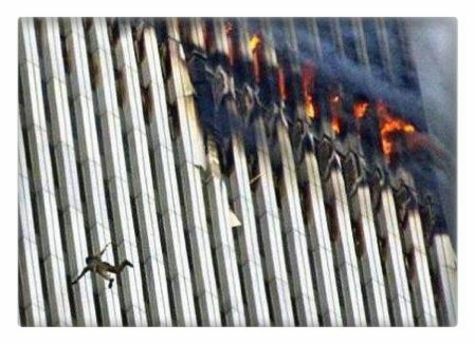 'When the second plane deliberately dove into the tower, someone said, 'The World Trade Center is one of the most recognizable symbols of America. We're sitting in a close second.'" 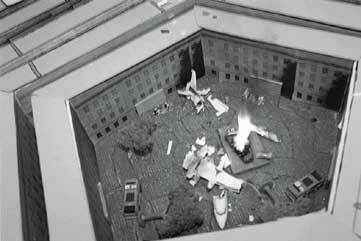 9:30 "Two airplanes have crashed into the World Trade Center in an apparent terrorist attack on our country. I have spoken to the Vice President, to the Governor of New York, to the Director of the FBI, and have ordered that the full resources of the federal government go to help the victims and their families, and to conduct a full-scale investigation to hunt down and to find those folks who committed this act"
9:30 , when the supreme commander states an attack on the U.S.A. the Pentagon stays quiet, Rumsfeld goes on with educating Senator Cox, and the Secretary of Defense Wolfowitz judged: "There didn't seem to be much to do about it immediately." As if interceptors were never deployed, existing or invented. As if air-policing was an unfamiliar word for the DOD and not being a NATO SOP (standard operational procedure). Mr Rumsfeld, recalls Mr Cox, watched the TV coverage from New York and said: "Believe me, this isn't over yet. There's going to be another attack, and it could be us." Moments later, the plane hit. "Secretary of Defense Donald Rumsfeld, who almost immediately was at the scene of the crash, gave aid to the injured and then organized a joint operations center ... "
"Defense Secretary Donald Rumsfeld was in his office inside the Pentagon when the blast happened with no warning. 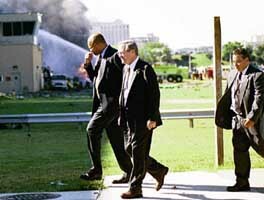 Rumsfeld rushed to the area of the blast and for 15 minutes helped load the wounded onto stretchers. He then retreated to the National Military Command Center where senior military leaders pondered the question: What Now." Paul Gonzalez, 46, a budget analyst, smashed a hole in the wall and crawled out. He was pulled to safety by Donald Rumsfeld who, although ordered by the secret service to leave the Pentagon, had refused. For 30 minutes we couldn't find him. And just as we began to worry, he walked into the door of the National Military Command Center." For nearly an hour since 9:40 apparently the NMCC did not know if Rumsfeld was killed or where he was - in times of cell phones, buzzers not only around Rumsfeld himself, but with his personal aides accompanying him. Is this plausible? Is it explainable? 10:30 "Defense Secretary Donald Rumsfeld enters the National Military Command Center." (Barbara Starr in'The Pentagon Goes to War': National Military Command Center - A look at 9/11 at the Pentagon's National Military Command Center. Rumsfeld himself recalls it differently: "Then at some moment I decided I should be in here figuring out what to do, because your brain begins to connect things, and there were enough people there to worry about that. I came back in here, came into this office. " "I went outside to determine what had happened. I was not there long because I was back in the Pentagon with a crisis action team shortly before or after 10:00 a.m."
"The "air threat conference call" - Pentagon officials familiar with the matter told USA Today that the call was broadcast over a loudspeaker inside the Pentagon's National Military Command Center, where Rumsfeld and Joint Chiefs Chairman Gen. Richard Myers were operating. The entire call was recorded and has been transcribed." Nice questions to come.... But why not the question about the TWO HOURS OF CRIMINAL "sitting on the hands"? "The secretary of defense directed the nation’s armed forces to Defense Condition 3,an increased state of military readiness.8"
And this reads: "8.The Secretary’s decision was broadcast on the air threat conference call at 10:43.A minute later,Secretary Rumsfeld spoke to the Vice President,and he asked Rumsfeld to run the issue by the President.At 10:45 conferees were told to “hold off”on Defcon 3,but a minute later the order was reinstated.Rumsfeld believed the matter was urgent and,having consulted DOD directives,concluded he had the authority to issue the order and would brief the President.Rumsfeld briefed the President on the decision at 11:15.See DOD transcript,Air Threat Conference Call,Sept.11,2001;Stephen Cambone interviews (July 8,2004;July 12,2004);DOD notes,Stephen Cam-bone notes,Sept.11,2001. NOTES TO CHAPTER 10 555"
"Rumsfeld believed the matter was urgent ..." Good joke. "The time was 1:02 p.m., less than four hours after terrorists steered American Flight 77 into the Pentagon's southwest wall." "The video monitor in front of him was blank, but there was an audio connection with the president at Barksdale Air Force Base in Louisiana." "This is not a criminal action," the secretary of defense told Bush over a secure line. "This is war." "We are, in a sense, seeing the definition of a new battlefield in the world, a 20th -- 21st century battlefield, and it is a different kind of conflict. It is something that is not unique to this century, to be sure, but it is -- given our geography and given our circumstance, it is, in a major sense, new for this country." "But what I said is enormously important, and that is that when classified information is compromised …perfectly willing to violate federal criminal law, and seemingly willing to put people's lives at risk -- their colleagues and their neighbors and their friends -- I think it's something that should stop." “The White House video teleconference was not connected into the area of the NMCC where the crisis was being managed.Thus the director of the operations team—who was on the phone with NORAD—did not have the benefit of information being shared on the video teleconference.... Moreover, when the Secretary and Vice Chairman later participated in the White House video teleconference, they were necessarily absent from the NMCC and unable to provide guidance to the operations team." So "when the Secretary [of Defense Rumsfeld] and Vice Chairman [of the Joint Chiefs of Staff Myers] later participated" (whatever later means, afternoon ?) they were "unable to provide guidance" caused by their absence. Rumsfelds office is situated 100 meters apart from the NMCC. His absence was voluntarily in the morning hours and only "later" caused by the participation in the teleconference. BTW CIMIC provides the presence of a high ranking FAA official in the NMCC. The war room had no "absence" of information, even without the teleconference. "Shortly thereafter .... Shortly thereafter ... 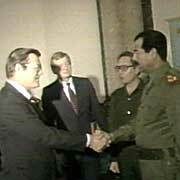 Shortly thereafter ... what had happened"
How did Rumsfeld "recall" these hours himself? (asked by the "Independend commission"
"The day of September 11th, the morning, I was hosting a meeting for some members of Congress. And I remember stressing how important it was for our country to be prepared for the unexpected. Shortly thereafter, someone handed me a note saying a plane had hit one of the World Trade Center towers. Shortly thereafter, I was in my office with a CIA briefer and I was told that a second plane had hit the other tower. Shortly thereafter, at 9:38, the Pentagon shook with an explosion of then unknown origin. I went outside to determine what had happened. I was not there long because I was back in the Pentagon with a crisis action team shortly before or after 10:00 a.m. On my return from the crash site and before going to the executive support center, I had one or more calls in my office, one of which was with the president. I went to the National Military Command Center where General Myers, who was the vice chairman of the chiefs at that time, had just returned from Capitol Hill." "Rumsfeld: I had said at an 8:00 o'clock breakfast that sometime in the next two, four, six, eight, ten, twelve months there would be an event that would occur in the world that would be sufficiently shocking that it would remind people again how important it is to have a strong healthy defense department that contributes to -- That underpins peace and stability in our world. And that is what underpins peace and stability. King: Right next door is your office. 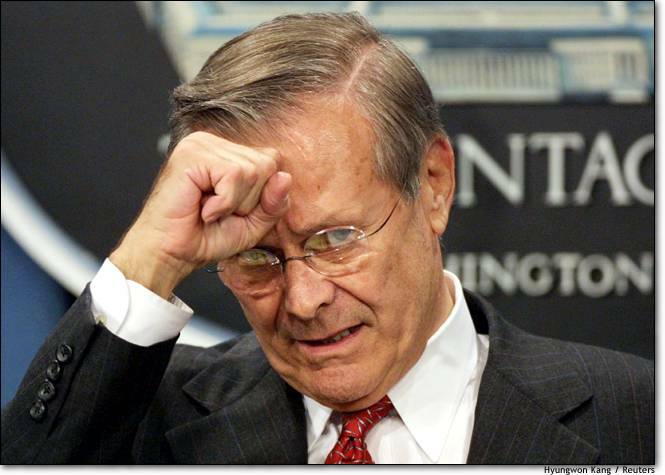 Rumsfeld: -- right next door here, and the whole building shook within 15 minutes." - Paul Hellyer, former National Defense Minister of Canada: "... Why did the President just sit in the schoolroom when he heard the news? Why did he not acknowledge that he already knew what was going on? As a former Minister of National Defense, when the news came out I had to wonder. 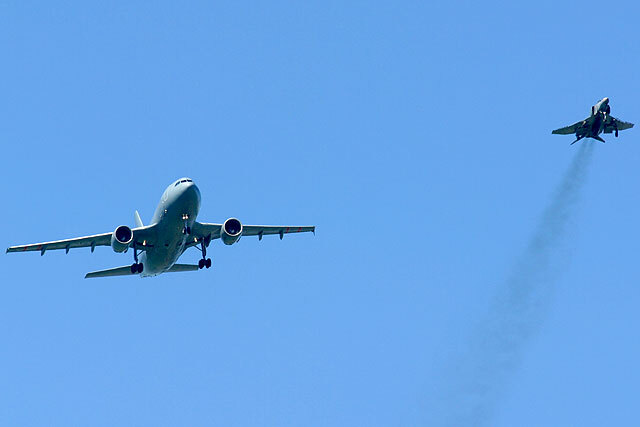 Why did airplanes fly around for an hour and a half without interceptors being scrambled from Andrews [Air Force Base]? Is it Andrews right next to the capitol? ... With a quick action alert they should have been there in five minutes or ten minutes. If not, as the Minister of National Defense, which in the United States is the Secretary of Defense, I would want to say "why not?" - Michael Meacher, British MP, environment minister from May 1997 to June 2003 : "This war on terrorism is bogus "
" ... those who did that should have flown in the area a long time, for example. The Pentagon is not very high, a pilot could come straight to the Pentagon like this to hit, he should have flown a lot in this area to know the obstacles which could meet him when he is flying very low with a big commerical plane to hit the Pentagon in a special place. Somebody has studied this very well, someone has flown in this area very much." "I find it hard to believe that people who were learning to fly in Florida could, within a year and a half, fly large commercial airlines and hit with accuracy the towers of the World Trade Center which would appear, to the pilot from the air, the size of a pencil. Only a professional pilot could carry out this mission, not someone who learned to fly for 18 months in Florida. For your information, a licence to fly commercial planes has many conditions, in terms of study and training. Many hours of flying are needed to qualify as a co-pilot, let alone a pilot, of such planes." "Almost 2 ½ hours after the first hijacking began, our country was still undefended. Had there been more planes hijacked that morning, as the terrorists once intended, they could have reached their targets and killed more innocent Americans." Senator Dayton on Video - Senator Max Cleland left the 9/11 Commission. Senator Paul Wellstone died in a plane crash. practised everywhere in exercises and in real, several times a year since decades. 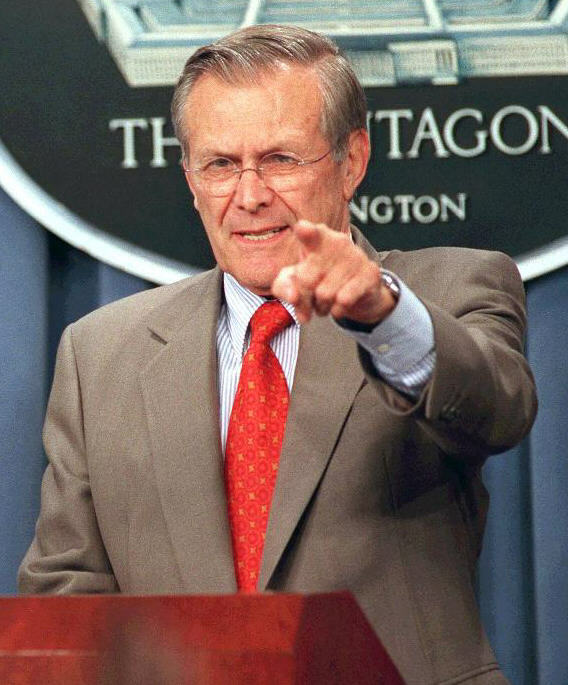 Some critics feel that Rumsfeld's responses on the day of the 9/11 attacks (which are outlined in the Pentagon press briefing of Sept. 15, 2001 ) were ill-advised or downright incompetent and that his alleged slowness in reaction was an unacceptable counter to what some have called the "Pearl Harbor of the 21st century". Specific criticisms of his conduct include his remaining in his office when the crisis management process was ramping up, his resolve to keep his morning schedule which included a breakfast with then-U.S.-Representative Chris Cox, and his failure to have interceptor jets launched from Andrews Air Force base, which some say might have changed the day's outcome. "One may conclude that, in the absence of a strong external shock to the United States—a latter-day “Pearl Harbor” of sorts—surmounting the barriers to transformation will likely prove a long, arduous process." ... the NMCC is the focal point within Department of Defense for providing assistance. In the event of a hijacking, the NMCC will be notified by the most expeditious means by the FAA. The NMCC will, with the exception of immediate responses as authorized by reference d, forward requests for DOD assistance to the Secretary of Defense for approval." (My emphasis) This order replaced an older one of 1997 and was edited on 1.June 2001. "Air Force Lt. Col. Vic Warzinski, another Pentagon spokesman, [said]: 'The Pentagon was simply not aware that this aircraft was coming our way, and I doubt prior to Tuesday's event, anyone would have expected anything like that here.'" Washington, D.C., Sept. 21, 2001 — "The Department of Defense (DoD) World Trade Center in New York City Sept. 11. ... Air National Guard and Reserve planes were in the air "moving stuff within an hour," he said." "Immediately"? "within an hour" ? 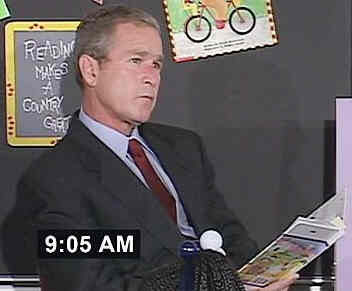 So the DoD KNEW what to do - except poor Rumsfeld, who -one hour after the first attack- still did not know anything ? "Floor-to-floor and interconnected vertical steel beams, sturdier windows and Kevlar armor panels used in the revamped exterior wall helped slow down the plane and mitigate effects of the explosion as the plane crashed through the Pentagon, Evey noted." 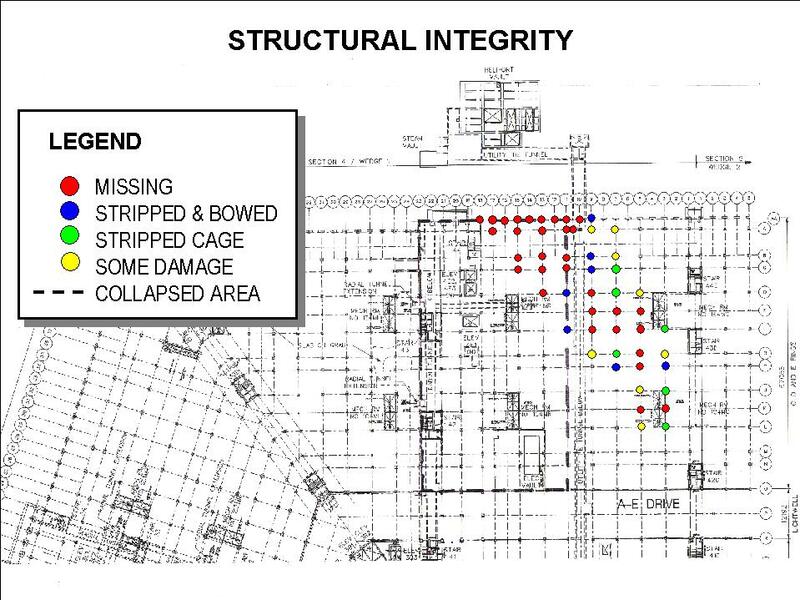 "The safety and security systems did what they were supposed to do," says Cecil G. Doyle, president and CEO of Hayes, Seay, Mattern & Mattern Inc., the Roanoke, Va.-based architect-engineer for the Wedge One project. The blast-resistant windows, which are framed in steel and bolted to the steel structure behind the exterior wall, helped save lives, officials say. Despite the huge impact of the crash, THE NEWLY INSTALLED WINDOWS ON THE THIRD AND FOURTH FLOORS WERE INTACT, but the old windows in the not-yet-renovated adjacent section blew out. The new windows "weren't designed to stop a 757, but they did provide some protection and we strongly believe some lives were saved because of the steel reinforcement around each of the windows," says Tom Fontana, the Pentagon Renovation Office spokesman. 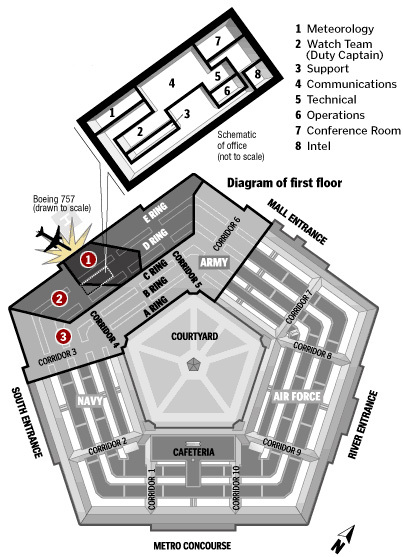 The airplane slammed into the LOWER TWO FLOORS of the five-story Pentagon, but shortly after the attack, the upper three floors collapsed. New steel beams in Wedge One "really held that facade up for an extra twenty-five minutes," Fontana says. At the point of impact, support columns were sheared and will have to be reconstructed. Floor-to-floor and interconnected vertical steel beams, sturdier windows and Kevlar armor panels used in the revamped exterior wall helped slow down the plane and mitigate effects of the explosion as the plane crashed through the Pentagon, Evey noted. I am unable to renovate every link in due time. But in case of a trial every Pentagon worker can state what PENREN meant - and there is a sufficient amount of copies of the documents. Here the point of impact in the only wedge with steel beams. And here the offices of Rumsfeld, Wolfowitz, the NMCC. Any commander (military, firebrigade, wherever) who is not at his post in the crucial two hours would face a trial. Normally. Even if he were NOT guilty by being involved in the plot or organizing the crime itself. He would be held responsible just for criminal negligence. 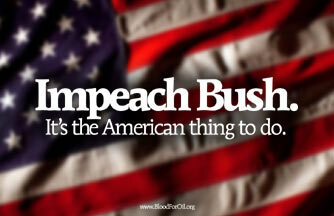 There is no need to begin with Bush. Notice: QRA is SOP(NATO standards). Air policing needs no special orders, and for sure not by the secretary of Defense. 8 - what do the generals and the political leaders think about countermeasures ? "236.The 113th Wing first learned from the FAA tower at Andrews that the Secret Service wanted fighters airborne." Be sure there exists much more data on Rumsfeld. But we are not interested in a biography on him. It makes more sense to concentrate on the two hours in which he wasn`t doing his job. It is the duty of the American people to act. It is my obligation to observe and warn and to speak out; since the whole world is engaged with the maniac efforts of these PNAC guys. Die Lügen des Herrn Rumsfeld: "The day of September 11th, the morning, I was hosting a meeting for some members of Congress. And I remember stressing how important it was for our country to be prepared for the unexpected. Shortly thereafter, someone handed me a note saying a plane had hit one of the World Trade Center towers. Shortly thereafter, I was in my office with a CIA briefer and I was told that a second plane had hit the other tower. Shortly thereafter, at 9:38, the Pentagon shook with an explosion of then unknown origin. I went outside to determine what had happened. I was not there long because I was back in the Pentagon with a crisis action team shortly before or after 10:00 a.m. On my return from the crash site and before going to the executive support center, I had one or more calls in my office, one of which was with the president. I went to the National Military Command Center where General Myers, who was the vice chairman of the chiefs at that time, had just returned from Capitol Hill." Er wußte vor 9.00h Bescheid, das Meeting begann erst um etwa 9.00h. Nach Rumsfelds Darstellung müßten ihm die Infos über die Einschläge jeweils mit etwa 20 Minuten Verspätung gereicht worden sein. Er sagt NICHTS darüber, ob, daß oder weshalb er nicht über die Entführungen informiert wurde. Der "Spiegel" referiert die Lügen, verbreitet sie weiter und deckt sie nicht auf. Kein Wunder, wenn man CIA-gestopft ist ... Die "kritische" Fassade soll darüber hinwegtäuschen, daß der "Spiegel" Nullkommanichts aufdeckt. Null. Rien. Niente.Nada. Nix. "Nach einer Identifizierung einer verdächtigen Zivilmaschine durch eine von der NATO- Luftverteidigung geführte Alarmrotte werden in einem Renegate-Fall die vom Jagdgeschwader 71 (Wittmund) oder 72 (Neuburg) kommenden deutschen Jagdflieger mit F-4F unter nationales Kommando gestellt und können im Zuge des Air Policing das verdächtige Flugzeug abdrängen, zur Landung zwingen, Waffengewalt androhen, Warnschüsse abgeben oder - auf Befehl des Verteidi-gungsministers - auch Waffengewalt anwenden. 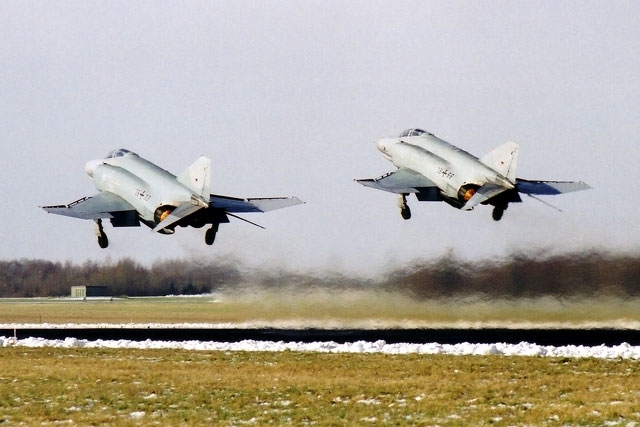 Für erzwungene Landungen stehen die Fliegerhorste Wittmund, Laage und Lechfeld zur Verfügung, als zivile Flugplätze wurden Hannover, Köln-Bonn, Leipzig, Hahn und München vorgeschlagen." a) Wer Rumsfeld wg. seiner Kriegsführung angreift, sagt damit, der Irakkrieg sei verloren (die eigentlich interessante Nachricht). Einen erfolgreichen Kriegsherrn greift man nicht an. b) Wer zugleich das Kriegsziel "Krieg gegen den Terror" aufrecht hält und keinerlei rechtliche Bedenken äußert, versteht entweder nicht, worum es geht odertaktiert bloß. Denn nicht einmal eine Exit-Variante wird angeboten. c) In einer Mafiabande gibt es gegenseitiges tödliches Erpressungspotential. Wer Rumsfeldsagt und nicht auch Bush und Cheney meint, müßte aberwitzig genug sein, die Bande auseinanderbrechen zu können. d) Die US-Demokraten bieten sich als die andere Seite derselben Münze an. Es müßte mehr passieren als der derzeitige Sturm im Wasserglas, um im Lauf die Pferde zu wechseln. e) Allerdings deutet die Dauernörgelei und -krittelei in Verbindung mit der Wirtschaftslage darauf hin, daß sich die Bushisten in einer Dauerkrise befinden - ohne einen echten Ausweg zu haben , aber auch ohne ihn seitens der Demokraten vorgeschlagen zu bekommen. Also bleibt zunächst einmal alles wie es ist.